One summer morning while walking down Kasturba Gandhi Marg in Connaught Place, The Delhi Walla was struck by this woman’s appearance. Amid a blur of tight jeans and salwars (no saree though), her blowy jungle-green harem pants stood out as a more sensible hot-day wear. 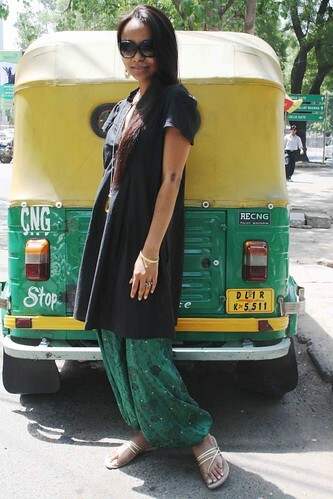 The black colour of her loose cotton kurta, however, seemed odd if beating heat was the intention. The consolation was that it matched with the black print on her pants, which was of handloom silk. More harmonious was the pants’ spotty golden zari work that echoed noiselessly in the woman’s accessories (earrings, bangles, chappals are not clearly visible in the picture above), all of which were in varying shades of the gold. If only she were not this thin, her elegance would have been less Elle-ish, and more real. you should have bumped into me. i am nice and plump. 😀 i love such clothes. they’re so nice and airy! i loath jeans completely. don’t even own a single pair now. Only one pic for this post (although saw other pics on your other post about stylish Delhiwallas? I have been to Delhi and I know that people have a great sense of fashion in India..at least in the metros. Love Indo-Western combination they wear. i don’t see her as “elle-ish”…..a 5’9 and above slim woman is more fitting of the term “elle-ish”..this woman looks like any other average middle-class young Indian woman walking down the street. love the harem shaped salwar kameez pants. I rather like the color combination of the Auto rikshaw parked at the back side. What amazes me is how Mayank actually gets random people to agree to getting themselves clicked or to giving him interviews. Art of persuasion I guess 😛 I don’t know if I could ever do it.